Find all the best hot dog restaurants in NY. If you have a craving for the best New York hot dogs, Fun New York will lead you towards all the best hot dog joints in NYC and other parts of the state. One of the Best Hot Dog Places in NY! Having received rave reviews from The New York Times, New York Magazine, Time Out NY, The Village Voice, Pix 11 Morning News, Zagat, and other prestigious sources; Bark is a go-to destination for some of the best hot dogs in NY! The scrumptious dogs come in such varieties as classic, NYC (sweet & sour onions, mustard), bacon cheddar, chili cheese, beans & frank, kraut, pickle, slaw, and veggie. The New York hot dog restaurant is open for lunch and dinner on Mondays through Thursdays from 12 P.M. to 11 P.M., Fridays from 12 P.M. to midnight, Saturdays from 10 A.M. to midnight, and Sundays from 10 A.M. to 10 P.M. You can also stop by for breakfast on Saturday or Sunday, from 10 A.M. to 3 P.M. Bark doesn't take reservations, as it is a first come first serve restaurant. Catering and delivery options are available. Tasty Hot Dogs in Unique Varieties! Known for offering the #1 weiner in NYC, Crif Dogs is one of your go-to dining destinations in the state. Choose from approximately 16 varieties of hot dogs and top them off with any fixin you desire! Order such funky items as the BLT dog (a bacon-wrapped dog with lettuce, tomato, and mayo) and the philly tube steak (with cheese and fried onions). The menu also includes burgers, fries, tater tots, shakes, floats, and beer. Perfect for grabbing a late night snack; the restaurant is open noon to 2 A.M. on Sundays through Thursdays, and noon to 4 A.M. on Fridays and Saturdays. 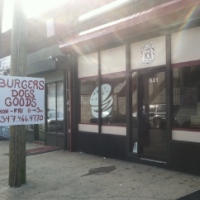 Crif Dogs has two locations: one in Brooklyn and one in Manhattan. Great Hot Dogs with Over 30 Gourmet Toppings! Rated the "best hot dogs" by the Long Island Press in 2011, the hot dogs at Bad Dawgs are bound to make you squeal with delight! The fresh, hot, juicy, flat top grilled, 100% all beef dogs are a hit amongst Long Islanders and visitors from other parts of NY. 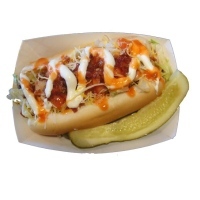 Choose from over 30 gourmet toppings; including sauerkraut, red onion sauce, lettuce, bacon bits, and sour cream. If you're not in the mood for a traditional hot dog, you can try one of the restaurant's delicious veggie dogs. Or order a fried chicken sandwich, loaded with all your favorite gourmet toppings. Delivery options are available. If you're planning a special event (i.e. : birthday, bar/bat mitzvah, block party), you can book a Bad Dawgs hot dog trailer! Check the website for more information. 12 Hot Dog Varieties and Deep Fried Desserts! 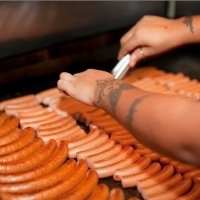 Using only the highest quality ingredients, First National Franks is committed to providing you with the most exciting and satisfying food--including some of the best hot dogs in New York. All jumbo 100% beef hot dogs will be perfectly customized with the toppings of your choice, and wedged inside a bakery or potato roll. Choose from about 12 hot dog varieties; including The Bronx Bomber--a hot dog with chili, onions, cheese, and deli mustard. Also available is a great selection of burgers, grilled chicken sandwiches, cheesesteaks, chili, and other delectable items. Top off your meal with one of the mouth-watering desserts; like deep-fried Twinkies, Devil Dogs, and Snickers. Restaurant hours are 11 A.M. to 8 P.M., Monday through Saturday. Serving the Best NY Hot Dogs since 1932! Serving quality products since 1932; Papaya King has consistently wowed its customers with special recipe franks and delightful tropical drinks. The famed NY hot dog joint even earned rave reviews from such culinary giants as Julia Child, Anthony Bourdain, and Martha Stewart. Zagat raved about the place being the "best, cheapest (stand-up) lunch in the city." Over the years, the New York staple has attracted customers from all walks of life--including movie stars, rock stars, and presidents. Order a classic frank, or one of the great specialty franks or all-beef sausages. Wash your delicious meal down with one of the yummy tropical drinks in such flavors as papaya, mango, coconut champagne, pina colada, strawberry fields, banana daiquiri, orange, and grape. Fresh Hot Dogs Made of Organic Meat Products! Dogmatic rewards its customers with delicious, freshly prepared, gourmet food that absolutely bursts with flavor! Focusing heavily on nutritional responsibility, the menu offers food that's not only good, but good for you. The menu includes sausage dogs made from such ingredients as grass-fed beef, organic turkey, all natural pork, and free range chicken and lamb. Gourmet sauces include cheddar jalapeno, truffle gruyere, horseradish mustard, chimichurri, mint yogurt, and sundried tomato feta. Accompany your dog with a side of "non-fried fries." The famously delicious (and healthy) hot dogs have been lauded by The New York Times, New York Magazine, and various other sources. 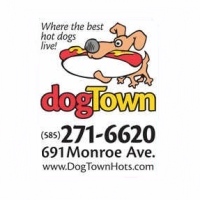 Order the Best Kosher Hot Dogs in NY! Surviving three depressions, numerous recessions, and two World Wars; Katz's remains one of the best delis in all of NY. Established in 1888, the deli has maintained the strong tradition of quality that made it popular amongst immigrants in the Lower East Side 100 years ago. In addition to serving some of the finest pastrami, turkey, and corned beef sandwiches in NYC; Katz's is known for some of the best hot dogs NY has to offer. All dogs are reasonably priced and unbelievably delicious! You may have to wait in a long line, since the famed eatery tends to get quite crowded. But for some of the greatest Kosher meals in NY and all of the U.S., it's well worth the wait! Black Angus Hot Dogs and Authentic NY Barbecue! Established in 2006, The Smoke Joint offers authentic New York barbecue in a casual, comfortable urban roadhouse setting. The venue has received acclaim from such renowned sources as The New York Times, Time Out NY, and The Village Voice. 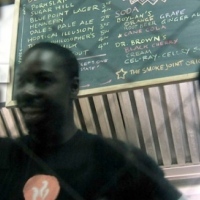 Try one of The Smoke Joint's scrumptious black angus dogs. Eat it plain or top it off with pulled pork, beef, or chicken. In the mood for a drink? The Pig Bar (adjacent to the restaurant) offers a wide variety of microbrews and artisan whiskeys. The restaurant also offers full-service catering and event planning options. Restaurant hours are noon to 10 P.M. on Sundays through Thursdays, and 11 A.M. to 11 P.M. on Fridays and Saturdays. Grab a Delicious Dog before you Hop Aboard your Plane! Are you looking for a quick, hearty, and delicious lunch before you hop on your plane out of New York? 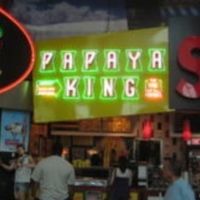 End your fun-filled trip to NY with a smile by stopping by the Papaya King hot dog stand at LaGuardia Airport! For an affordable price, you can feast on one of the eatery's special recipe franks and wash it down with one of the wonderfully tasty tropical drinks. 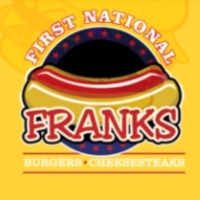 Order a classic frank or one of the specialty franks; featuring such toppings as onions, sauteed mushrooms, meat sauce, chili, and cheese. Or you can order one of the jumbo all-beef sausages. The tropical drinks are available in such flavors as papaya, mango, coconut champagne, pina colada, strawberry fields, banana daiquiri, orange, and grape. Also available are fresh juices and smoothies. 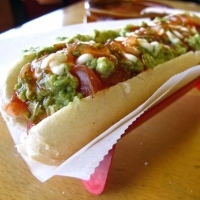 Chilean Hot Dogs that will Make your Mouth Water! A great Chilean bakery and restaurant, San Antonio Bakery # 2 is known for serving some of the best hot dogs New York has to offer! For only $3.50 you can order an all-beef dog, nestled into a freshly baked bun and topped off with sauerkraut, chopped tomatoes, mashed avocado, and a squiggle of mayo. The delectably non-traditional hot dogs have been raved about by many locals and periodicals like the Long Island Newsday. For the best Chilean food in NYC, make San Antonio Bakery your go-to destination! Other yummy items include Chilean style bread, empanadas, Chilean style sandwiches, and custom pastries. Hours are 8 A.M. to 7:30 P.M. on Tuesdays to Saturdays, and 8 A.M. to 6 P.M. on Sundays. The Greatest Comfort Food in New York! Burgers N Dogs is known for serving some of the best comfort food in New York, including some of the most delicious hot dogs. Don't expect your normal, everyday hot dog. All quarter-pound hot dogs are deep fried, giving them a more distinctive flavor. Pair off one of the exquisite dogs with the restaurant's hand-cut fries, all of which are seasoned to the point where you'll never need ketchup! The restaurant also features some of the greatest mac 'n cheese that will ever meet your taste buds! All mac 'n cheese dishes are made with four types of cheese, littered with bacon, and pack a spicy kick. Other tasty options include juicy half-pound burgers, fish tacos, empanadas, and Mexican chili. One of NY's Most Historic Hot Dog Shops! Established in 1932, The Famous Lunch is a historic hot dog shop in NY that continues to live up to its name. The hot dogs are regarded by many Upstate NY locals as the best in the area! After you're finished with your lunch or dinner, try the rice pudding--which is absolutely divine! Though it's referred to as "The Famous Lunch," the restaurant also offers a full menu of yummy breakfast items. The entire place has a unique, old-fashioned vibe as it maintains the same look and feel as it did approximately 80 years ago. Hours are 7:00 A.M. to 10 P.M. every Monday through Saturday. If you need any more information, please call 518-272-9481 or send an e-mail to famousl@aol.com. Great Hot Dogs for Carnivores and Vegetarians Alike! What makes Dogtown one of the best hot dog places in New York? For one thing, the rolls are made from French, custom-cut bread that's baked fresh daily. 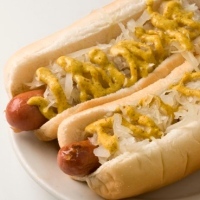 The dogs themselves are German-style franks that absolutely explode with great taste! Choose from a large array of specialty dogs, including the Golden Retriever--a hot dog with two strips of bacon and covered with melted cheddar. Even if you're not a hot dog fanatic, you will be blown away by these fantastic, one-of-a-kind franks. If you're a vegetarian, you're given 15 varieties of incredible veggie dogs to choose from! Other vegetarian/vegan options include hand-made veggie burgers, the best veggie chili in town, meat-free soups, grilled portobello sandwiches, and veggie Italian sausage.